Given below is relevant information about the different routes for traveling to Amritsar. Know how to reach Amritsar. Vibrant, spirited and historic are words that best describe the city of Amritsar. A world renowned pilgrimage destination, Amritsar has conventionally become and a holiday destination as well. Like all the major cities of India, Amritsar too is on the road to progress, what with new multiplexes coming up, improved transport system and so on. Being an important city in the state of Punjab, Amritsar is well connected to the other cities of India and world, through different modes of transport like air, rail and road. The following lines would give you a complete detail about the different ways of traveling to the city of Amritsar. Amritsar has a lavish and well developed airport, just 11 km from the main town of the city. Earlier known as Raja Sansi International Airport, it has been recently renamed as Guru Ramdas International Airport. It is the only airport in the state of Punjab that operates internationally. All the major domestic airlines have regular flights to and from the city. Apart from the domestic flights, international flights connect Amritsar to Turkmenistan, Uzbekistan, London, Toronto, Birmingham, Singapore, Turkmenistan, Kazakistan and various other cities. 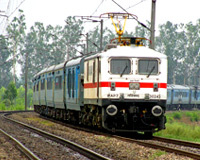 Amritsar city has a vast railway network, connecting it to most of the major cities in the country like Delhi, Mumbai, Kolkata, Bangalore and Hyderabad. The station is centrally located, at a distance of 15 minutes drive to the Golden Temple. The holy city of Amritsar is located on the historic Grand Trunk Road (G.T.Road) also known as National Highway 1. There are regular bus services to several cities like Chandigarh, Delhi, Shimla, Kulu, Manali, Dharamshala, Dalhousie, Dehradun and Rishikesh. Amritsar is also connected to Pakistan by a special bus service.